HUD’s Office of Housing Counseling (OHC) supports a nationwide network of more than 1,800 housing counseling agencies. Struggling homeowners at risk of default who work with a housing counselor are more likely to get a loan modification and are 30 percent less likely to face foreclosure, compared to similar owners who did not get counseled. The median wealth or net worth of a homeowner is nearly $200,000, or 36 times greater that of the median renter who had just over $5,000. Homeowners move far less frequently than renters, making it easier to build community networks and support systems. Children of families who own their homes are more likely to graduate high school and earn more income later in life. Last year alone, more than 1.2 million people turned to FHA to help them buy a home or to refinance into a lower cost mortgage. Today, an estimated 40 percent of all borrowers turn to FHA to purchase their first home. 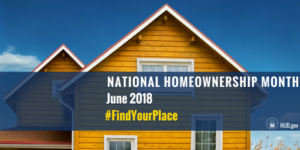 44 percent of home purchases by African American families and 43 percent of home purchases by Hispanic families are assisted by FHA. To see a short video of HUD Secretary Ben Carson reflecting on the legacy of the 1968 Fair Housing Act, click here .